There's really nothing more fun than eating dinner with a bunch of friends. It's been a really long time since I was truly able to have people over for dinner; it's not an exaggeration to say that my old apartment was literally the size of the bedroom in my current apartment. (Which is not to say my new apartment is huge, rather it's to say my old apartment was really, really small. Remember the floor pie?) As soon as I moved and was settled, I called up my friends and invited them over for a tradition that I have since I moved into my own place; dinner and Project Runway. Now, I'm not here to debate with you the merits of my favorite reality TV program, other than to say that it is the best and I will be throwing it a funeral when it moves to Lifetime. But, it's a show me and my friends, both female and male, enjoy a lot, and the only things that makes good TV better are good food and good drink. I left it up to my friends to supply the booze, while I focused on dinner. For dinner, I went with something both easy and impressive, a time-honored classic: macaroni and cheese. I love macaroni and cheese from the box, and I think that even though it's obviously really fake processed cheese, growing up on Kraft (especially with the absence of homemade baked macaroni and cheese – not a criticism, Mom!) makes you prefer a certain level of creaminess and sauciness in your macaroni and cheese that you don't often get when you're doing the baked version. So it was with delight that I found that the recipe I followed – from another TV favorite of mine, Alton Brown and his Good Eats show – allowed for a really cheesy, really creamy sauce and a nice crispy crust on top. I made it with cheddar – half farmer's market cheddar I had left over, and half grocery-store cheddar I picked up to fill in the gaps – but you could literally use any blend of cheeses you want. It would be a fun way, I think, to really try out some of the local dairies around here; ask them which of their cheeses they would use in mac and cheese and just do this recipe substituting those for the cheddar. 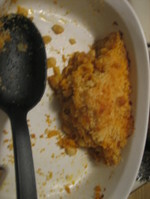 I left out a couple things, and cut down on some others (the original recipe called for more panko crumbs and onions, which I omitted), but the result was cheesy, salty, smoky, and fantastic. I barely had enough left over for lunch the next day. For sides, we whipped up a quick garlic bread and a salad with mixed greens, chopped raw beets, chopped raw pears, feta cheese, and quickly thrown together balsamic vinaigrette. More hearty sides would go perfectly in the winter time. Preheat your oven to 350 degrees. Boil your pasta to al dente (when it is done, just set it aside). While your pasta is cooking, melt the butter in a saucepan and add the flour and ground mustard to create a roux. Whisk continuously while it cooks for about 5 minutes, preventing any lumps from forming. Add the hot milk to the pan (never ever, ever use cold milk for this), as well as the paprika and the bay leaf and whisk well. Simmer for about 10 minutes until it has started to thicken (but keep an eye to make sure it doesn't turn gluey). Remove the bay leaf. Temper the egg and add it to the milk mixture, then add 3/4 of your cheese (or more, if you prefer; I always grate and keep extra around, especially for the crust). Stir until the cheese sauce is nice and smooth. Then add your pasta and mix well. Season with salt and pepper to taste. 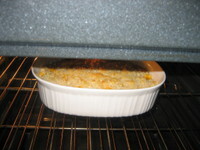 Pour the mac and cheese into a lightly-greased casserole dish (for easier scooping later). In a frying pan, melt the butter for the topping and add the panko crumbs, tossing them together to coat. 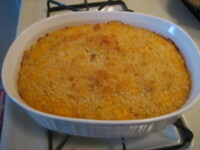 Cover the top of your mac and cheese with the remaining grated cheese and the panko crumbs. Bake for 30 minutes. Allow to rest and cool on your stovetop for 5 minutes before serving. I found this mac-n-cheese recipe on Epicurious a few years ago and cannot make it often enough in the winter months. Now I can alternate between that one and yours! this sounds delicious...I usually make G. Garvin's recipe (includes proscuitto and truffle oil) but I like the idea of using panko. This is my own personal macaroni nirvana: Baked Macaroni & Gouda with carmelized onions and sweet/hot sausage. This is my favorite recipe, although I usually double the chipotle pepper to macaroni ratio. This is my favorite recipe. I use more thyme, panko crumbs, and I bake it for less time than stated, resulting in a creamier texture. The combo of brie, cheddar, and gruyere is out of this world! !